The history of smartphone improvement has largely relied on companies cramming faster or more powerful components into the now ubiquitous glass slabs we carry around. But the Pixel 3 is something else. Instead of focusing on things like a brighter screen, tons of RAM, or multiple rear cameras, almost all of the Pixel 3's advantages come from a software-first mindset. This results in a smarter, more intuitive experience that feels very different from the hardware-driven approaches employed by many of Google’s competitors. And while this isn’t Google’s first attempt at something like this, this third Pixel (we evaluated both it and the Pixel 3 XL) is the device that really pulls all of Google’s efforts together and makes it feel special. For those unfamiliar with the latest version of Android 9 Pie, Google’s mobile OS is what ties everything together. Clean and unfettered by add-ons or extra BS, Android on the Pixel 3 feels fast and snappy unlike anything else, though it’s difficult to say if that is simply the result of speedier animations or superior software optimization. Then you add on things like Google’s Living Wallpapers (which are endlessly entertaining), features from previous Pixels like Google’s Now Playing song ID feature, and the new stuff like Call Screen. You end up with one of, if not the most considered out-of-the-box smartphones experiences, no customizing required. In fact, Google’s Call Screen feature, which lets the Google Assistant intercept phone spam, may be the most important development since caller ID. 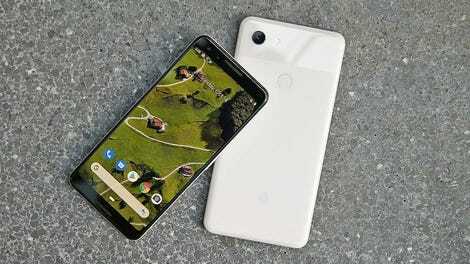 But nowhere is Google’s software prowess more evident than with the Pixel 3's cameras, which largely eschew the current trend of cramming as many sensors and lenses onto a phone as possible in favor of sophisticated computational photography. For the rear camera, this means that in everyday situations, the Pixel 3's lone 12-MP camera often has an edge over Apple’s iPhone or a Samsung Galaxy in terms of colors and sharpness. And when it comes to things like cityscapes, Google’s HDR+ mode is especially engaging as it merges multiple frames and exposures together to produce shots with more detail in bright spots and richer colors and shady areas, often defying what you think is possible from a smartphone camera. Look at all the sharpness. I also love the Pixel 3's front cameras, which take the phone’s HDR processing and combines with it a second 8-MP camera to marry the best of what software and hardware can offer. That’s because as long as you’re not afraid of letting blemishes show, the Pixel 3's selfies are mystifyingly sharp in a way that often makes images from other $1,000 phones look bad. And when you want to snap a group selfie instead of a personal one, the Pixel 2's second cam lets you capture the same shockingly detailed images with a wide-angle field of view. While the Note 9's pic may have been a slightly more accurate, the Pixel 3's advantage in color, exposure, and detail is obvious. Thanks to enhanced HDR+, the Pixel 3 makes what otherwise be a nice pic from the iPhone XS Max look dull and unsaturated. Even though I prefer the warmer colors from the Note 9's pic, the Pixel 3's pic captured much better details, especially in the teapot’s gnarled wooden base. This one is a bit closer, but the Pixel 3 gets the nod for not blowing out details on the seagull. Initially, I predicted that Pixel 3 would win this shoot-off easily. However, the Note 9's pic is superior in almost every way. The Pixel’s HDR+ mode doesn’t always guarantee a superior pic. If you zoom in, you can see how badly the Pixel 3 can struggle in low-light situations. Once again, HDR+ isn’t a substitute for good optics. While it’s hard to compare zoom photos exactly because Google doesn’t give you any numbers when zooming like Samsung and Apple do, if you look close, the Pixel’s Super Res Zoom makes the buildings look more like a watercolor than a photo. This one is a toss up because while the Pixel 3 captured a more detailed horizon, the Note 9's shot is less grainy and offers up richer, less muddy colors than the Pixel 3. As for the Pixel 3's general design, aside from the Pixel 3 XL’s unmistakable notch (which I’ve taken to calling “the bathtub”), the physical dimensions of both the 5.5-inch Pixel 3 and 6.3-inch Pixel 3s have changed so little that Google’s new official cases fit just as well on last year’s phones. Instead, Google worked on improving the Pixel’s build by adding new IP68 water-resistance, moving the volume rocker to the right to create a completely unblemished left side, and installing a new one-piece glass back. Inside, the Pixel 3 is powered by a Qualcomm Snapdragon 845 chipset, which puts it on the same playing field as every other high-end Android phone. However, the Pixel 3's 4GB of RAM and 64GB or 128GB storage feel a bit skimpy for a phone that starts at $800. That isn’t to say the phone needs more memory, but when it comes to value, not having extra RAM, or a microSD card slot for the option to tack on even more storage feels bad for a flagship device. Thankfully, Google didn’t ax the phone’s dual front-facing speakers, which are way louder than before, and when combined with Google’s Pixel Stand wireless charger, lets the Pixel 3 double as a mini smart speaker/home hub combo. Notch or no notch? You decide. And even though I’ve had the Pixel 3 for less than a week, the phone has made a lasting impression. 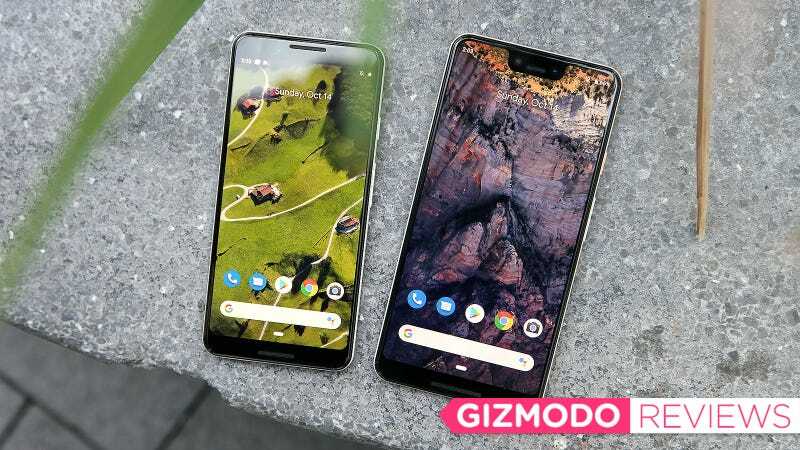 Google’s dedication to software excellence is something that I’d say has finally surpassed the iPhone when it comes to being the simplest, most no-nonsense handset, particularly for the less technically inclined crowd. More often than not, the Pixel 3 is thoughtful, and presents you with the tools and info you want, and streamlines the process so that accessing them isn’t a hassle. However, I’d be remiss not to mention the downsides of Google’s game plan. The first and most obvious case are features like Top Shot mode. The Pixel’s software makes it hard to tell if the feature is working because it’s linked to the camera’s seemingly unrelated Motion setting, which can be set to off, auto, and on, with auto and on potentially giving you different results. But the settings complications don’t end there, because controls for major features like HDR+ aren’t shown by default. That means out of the box, you can’t actually turn on the phone’s HDR+ enhanced mode, which is very different from standard HDR+, and to even see the option in the main camera UI, you need to go into the camera’s advanced settings and enable the HDR+ control. Since the Pixel’s HDR+ is the best and most important part of its picture taking process, it shouldn’t be this difficult to turn on. But the true plight of a software-first mindset is that it can often feel like the user experience is never fully complete. Currently, the Pixel 3 is missing Duplex, Google’s AI-powered phone reception feature that can book appointments or make reservations over the phone on its own, as well as Night Sight mode, which is a special setting dedicated to capturing challenging low-light pictures. It’s unclear when they will be available. These are two major things Google teased at the Pixel 3's launch event, and in the case of Night Sight mode, it’s an even bigger bummer, because as is, the Pixel 3 often struggles in very low-light situations. And then there’s the Pixel 3's big what if: How much better could the Pixel 3 be if Google cared a little more about both hardware and software? On the standard Pixel 3, its bezels look oversized and slightly wasteful compared to even 18-month old phones like the Galaxy S8, while the bathtub notch and big chin on the Pixel 3 XL appear even clunkier. Also how about those cameras. With the inclusion of a new dual-cam system in front, Google clearly understands the value of having multiple cameras, and yet the camera in back doesn’t get any extra help. That’s frustrating because even though the Pixel’s Super Res Zoom feature is fine, it’s still not as good as a real 2x optical lens. There’s also a small concern regarding quality control because after turning them on for the first time, I noticed that the Pixel 3 and Pixel 3 XL’s OLED screens featured noticeably different color temperatures, which only gets worse the more off-center you are. Why do Pixels seem to be the only high-end phone that suffer from manufacturing variations this big? Same brightness, same settings, same everything. Google says some variation between displays is a normal part of the manufacturing process, which is true. But this is the second year in a row this has happened with Pixel devices. I can’t remember ever seeing such a big discrepancy when it comes to the displays on flagship Apple and Samsung handsets. However, don’t let these things distract you from what Google has accomplished. The Pixel 3 more than any phone before shows an almost Nintendo-like philosophy where it’s not the device’s specs or hardware that matter most, but the overall user experience. And on the Pixel 3, Google has taken its software and made it king, solving problems and preventing others with intelligence and good design. The Pixel 3 highlights the best of software-first smartphone development process, and aside from a handful of minor issues, it’s an overwhelming success. The downside to Google’s software-centric approach is that it can feel like you are always waiting for the next update to get things like Duplex or the camera’s Night Sight mode, which aren’t available yet. The micro-ectched glass back is a joy to touch and the black painted USB-C port is nice detail, but the Pixel 3's overall appearance is still a little underwhelming. The kind of images the Pixel 3 can capture with a single rear camera are amazing, but then you wonder how much better things might be if Google cared more about hardware.